Standard rooms at The Verda Carmona are tastefully decorated and well maintained with an amazing interior. Standard rooms at The Verda Carmona are tastefully decorated and well maintained with an amazing interior. Featuring the total area of 246sqft, each room has a balcony which offers a scenic view of nature to the guest. 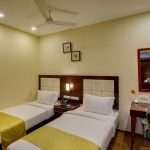 The standard rooms are filled with all the modern amenities, making the stay of the travelers more relaxed and comfortable. 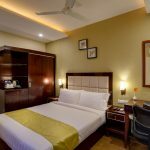 Some other features associated with this rooms are ceiling fans, flat screen television, hairdryer, in-room service, mini bar, safety box, tea/coffee maker, any many more.